Below report by VANGUARD is very ridiculously scary….. 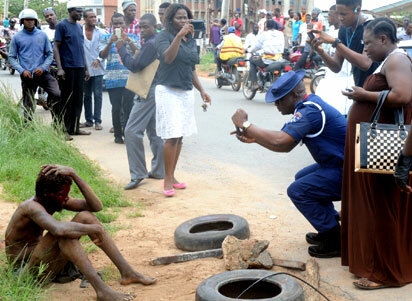 According to reports, residents of Ibadan rushed to catch a glimpse of the suspected human eater. The suspect was, however, whisked away by armed policemen to avert jungle justice. Also, another man was mobbed by angry crowd after a price list of human parts was allegedly found on him. Vanguard gathered that the suspect caught with human tongues was arrested at Oni and Son Memorial Hospital area of Ring Road. A source said that over 400 posters of a politician contesting the 2015 governorship election, women underwear and some weapons were found on him. The source said he was rounded up by the policemen from Oluyole Police Station. Another man, who reportedly disguised as a destitute, was caught at Adeoyo State Hospital with a price list of human parts. After they were beaten by the mob, policemen took the three men to the State Criminal Investigation Department, SCID. According to information, the ‘mad’ man was exposed when his hidden blackberry phone rang. This was said to have aroused suspicion of passers-by who had all the while known the man as a destitute. Further search on him, Vanguard gathered, revealed that he listed those owing him outstanding balance and the human parts they bought. That was when the mob descended on him. When Vanguard got there, the police refused to comment saying the newsman should go to the police headquarters at Eleyele, Ibadan for reaction. The man that jumped to escape being robbed of his money by two men on commercial motorcycle, it was further gathered, was rescued by policemen who were on duty under the flyover and taken to the hospital in an ambulance, as he sustained injury in his arms. The Police Public Relations Officer, SP Olabisi Ilobanafor, confirmed the arrest of a man who was beaten by the mob but said he did not know anything about the Adeoyo State Hospital incident. She said: “I can’t say whether he is a ritualist or destitute. I don’t know whether things found on him were human tongues or not. “It is only a forensic expert who can say precisely what they are. We use this opportunity to warn members of the public not to take laws into their hands by resorting to jungle justice whenever they see a suspect. This entry was posted in Men, News.